Vancouver celebrated its 40th year under blue skies and perfect running weather. More than 14,000 runners participated in the full marathon, 1/2 marathon, 8K or McDonald's MaraFun for children. 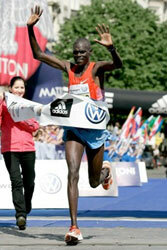 The Marathon celebrated this significant milestone in style. Featured guests included Kathrine Switzer and Roger Robinson. Roger's return to Vancouver was particularly significant as in 1981, he set the masters record for the BMO Vancouver Marathon with a time of 2:18:45, a time that has yet to be beaten. Kathrine and Roger added a special flair to the event. They were keynote speakers at the alumni brunch held on 30 April that welcomed more than 120 former race directors, race winners and other members of the marathon family. They were also part of the speakers program at the Brita Runner's Expo, and provided expert race commentary alongside Steve King on event day. Next year's race is on 6 May 2012, and it will feature a new venue and new course, both of which will be announced shortly. Registration is now open. Visit www.bmovanmarathon.ca for complete details. Twenty years after her first world title at age 13 Lydia Cheromei smashed the course record in Prague by three minutes, and improved her best time by half a minute writes Andy Edwards. Cheromei went through 10km in 33:20 — just outside 2:20 pace. By halfway the pace had slowed (1:10:41) but still promised a course record and personal best, as Ethiopia's Belainesh Zemedkun trailed by well over a minute. Although she slowed over the second half, Cheromei remained in control to stretch the margin of victory to almost six minutes. In far from easy conditions, Tadesse Yeshimebet finished second and Zemedkun was only two seconds outside her personal best. South Africa's Rene Kalmer debuted with a qualifying time for this year's World Championships and Serena Burla of the USA improved her best by almost two minutes. In the men's race a group of 14 went through halfway in 1:03:47, a tempo which offered the prospect of a finishing time in the mid-2:07s. The group slimmed down to a quartet by 25km: Barus, his fellow Kenyans Kenneth Mungara and Sammy Kosgei and Ethiopia's Gudisa Shentema. Shentama dropped back first, and Barus waited until 39km to make his move. 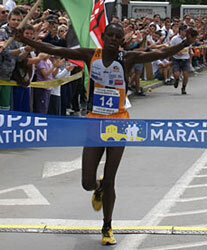 He soon had a lead of ten seconds over Kenneth Mungara and extended that to 31 seconds at the finish. Mungara himself was delighted to set a personal best at the age of 38 while Sammy Kosgei, after his debutant's third place acknowledged that: Running Prague is not easy! 8400 competitors from 90 countries took part in this 17th edition. Nahashon Kimaiyo's sub-2:11 time was recorded in very warm weather which helped to dispose of the challenge of Austria's Günther Weidlinger, who collapsed and had to get medical treatment after dropping out at 25km. 18 year-old Merima Mohammed was more than five minutes clearin the women's race but temperatures over 20°C and a strong wind ruined hopes of faster times. 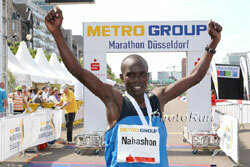 Altogether 14,000 athletes competed in the METRO Group Marathon Duesseldorf and associated events. Kimaiyo made an early move when the designated pacemaker, André Pollmächer, started to flag after 18km. With 24km to go, no one dared follow his pace and he passed halfway in 63:55, 40 seconds ahead. "I was surprised that none of the others went with me," said Kimaiyo, who just missed his personal best. German debutant Jan Fitschen battled through with a time of 2:20:15 in eighth place. Merima Mohammed had the help of pacemakers but ran her own race right from the start. By 10km (34:53) she was more than half a minute ahead; by halfway, reached in 1:13:25, she was 90 seconds up. In the rising temperatures she had to give up hopes for a personal best or course record: I did not feel comfortable in the heat. I am used to cooler conditions because I train at an altitude of around 2,000 metres, she said. 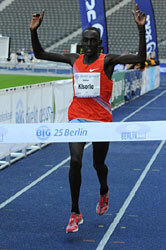 BIG 25 Berlin has confirmed its position as the world's leading 25km race. Despite the warm weather world leads for the men and women were established. A year ago both world records were broken, and this time Mathew Kisorio clocked the third fastest time ever run at the distance, missing the world record by just 23 seconds. Adding other running events 10,423 entered this 31st edition. "Although it was too warm for a record we had more spectators on the course said Race Director Gerhard Janetzky. The men's race was at world record pace until the half marathon point. It was only lost in the final 3km, as Kisorio ran alone. 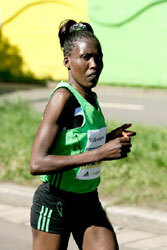 In the women's race Filomena Chepchirchir confirmed her rating as favourite by dominating the race and winning for the third time following her back to back victories in 2007/8. A record number of runners, a record number of countries and a new course record were achieved in the 5th edition. 3000 participants from 33 countries participated in the marathon, half marathon and 5km charity run. In the perfect weather conditions Dickson Terer and Cecilia Wangui Warutumo set new course records. The race incorporated the Balkan Marathon Championship, won by Mehmet Ali Akbas from Turkey and Sladjana Perunovic, who set a new Montenegrin national record.